5 Which are The Best Shooting Sticks for Hunting? The best shooting sticks for hunting will provide you with durability; the kind that doesn't last just one season, but that you can depend on as a quality addition to your hunting gear. You need a hunting stick as rugged as you are, that can take a beating, and that won't slow you down. With all the demands that hunting places on you and your gear, we've put together a list of the best of the best, four of the industry's top shooting sticks. Our top pick is the Primos Generation 2 Trigger Stick. We'll explain why right away. This is a full size shooting stick with an innovative trigger lock that allows for fast and easy height adjustment. A simple flick of your finger on the locking lever then locks the trigger -keeping your shooting stick at the perfect height even if you accidentally bump the trigger. It adjusts from between 33 inches and 65 inches, allowing you to use this shooting stick for hunting while sitting, kneeling, or standing. It features a patented exterior finish that allows the telescoping legs to move not just fluidly, but silently -making it one of the best shooting sticks for coyote hunting. The comfort grip, wrist strap, and textured rubber footing make this shooting stick a great walking stick, also. Its light weight of only 1.6 pounds and durable aluminum construction mean that it won't weigh you down while still providing the ruggedness that you need when out in the field. The rubber fin padded gun rest is removable to allow this shooting stick to also be used as a monopod for spotting scopes, cameras, or binoculars. This shooting stick adjusts from 30 inches to 63 inches to give you the flexibility to use this stick while sitting, kneeling, or standing. It's constructed of lightweight aluminum bringing it in at a barely noticeable 12 ounces. 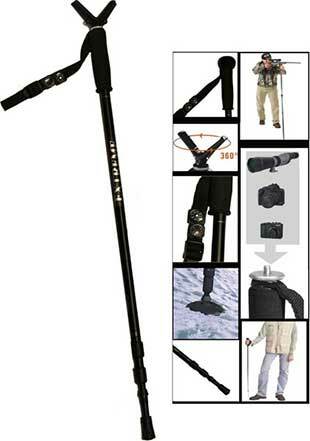 Due to its light weight and flexible design, this shooting stick can also be used as a walking stick. It has a wrist strap with a built-in liquid filled compass and thermometer for added usability and function, as well as an EVA foam grip for more comfortable use. 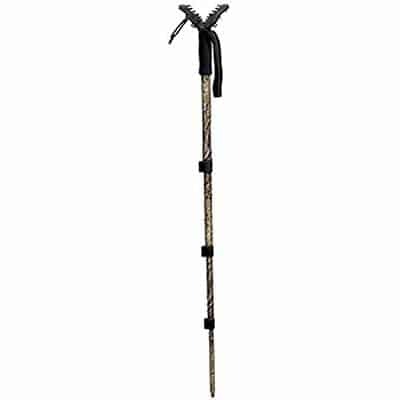 It also features an innovate spring loaded anti-shock design that helps to absorb shock and reduce stress on joints, muscles, and ligaments when you use it as a walking stick; this feature can be disabled with a simple turn of the stick. The exterior features a corrosion resistant finish to increase the life of this shooting stick. The gun rest swivels a full 360 degrees and is removable for use with spotting scopes, binoculars, and cameras. It comes with a removable rubber foot that covers a carbide tip, and also comes with a snow disc. See more of the Extreme Deluxe... Click here. 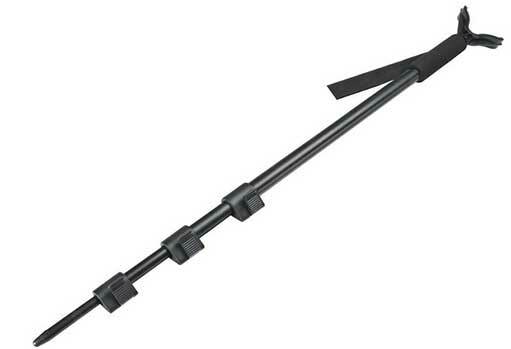 This is a full sized shooting stick with telescopic four section leg that extends from 23 inches to 62 inches. It features a quick-release lever lock system that allows for fast set up as well as fine adjustments. This shooting stick is made of tempered aluminum that provides strength and durability, as well as the light weight of 2.6 ounces. The gun rest top features rubber fins that afford a strong grip on your gun while protecting it against damage. It has mossy oak brush camo and a SilenTech rubber finish that helps you to remain stealthy in the field as it won't make a metallic clanging sound should you bump it on a rock or your gear. The rubber gun rest is removable to allow this shooting stick to be used as a monopod for your spotting scope, camera, or binoculars. It has an alloy tip that is removable so that you can attach whatever type of tip you may need, such as a snow cup. This is a no-nonsense compact shooting sticks that is perfect for those hunters who don't care about the frills, who just want something that will hold up in the long run and get the job done every time. It's a full size shooting stick for hunting that adjusts from between 21.5 inches to 61 inches. It features telescopic four section legs that are easily adjusted with flip locks at each junction point. This is an ultra-lightweight shooting stick, weighing just 8 ounces. It has an EVA foam grip and wrist strap that, when taken into account with its light weight, make this shooting stick function well as a walking stick. It also features a padded gun rust to afford greater grip and protect the barrel of your gun from damage. For the utilitarian minded hunter, you won't find a better shooting stick than this and certainly not at this price. 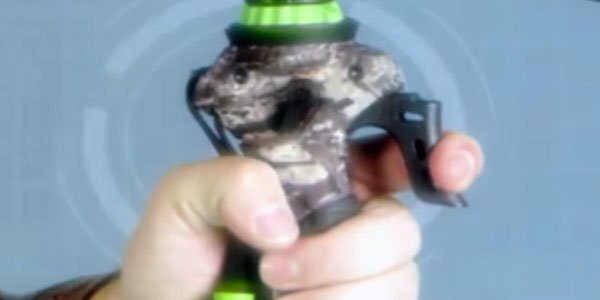 See more of this Mossy Oak Hunting Accessories Shooting Stick... Click here. Which are The Best Shooting Sticks for Hunting? If you need extra support to hold a steady shot while hunting, a shooting stick can make the difference, improving your accuracy and helping to prevent your arms from tiring more easily. These four are considered to be the best shooting sticks for hunting out there, offering the ruggedness and light weight that provide the most functionality when you're out hunting. We had to choose the Primos Generation 2 Trigger Stick for our number one pick. This shooting stick has feature after feature, offering high performance and versatility. While we weren't taking price into account when choosing the best shooting stick, this one is surprisingly affordable which only makes us love it more. Click here to buy the ﻿﻿Primos ﻿﻿Gen 2 Trigger Stick on Amazon!